Calmin Rosacea Serum 50g – Our product for spots and lumps associated with Rosacea. Calmin Rosacea Redness reducing day cream 50g – Redness reducing daily moisturiser. Calmin Rosacea Night-time seabuckthorn 50g – Night cream, intensively moisturising. 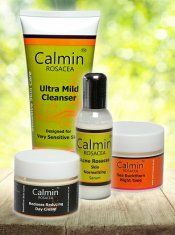 Calmin Rosacea Ultra Mild Cleanser 200g – Use with our cotton wool disks for irritation free cleansing. Salicylic acid, please note this product Calmin serum, is not for use during pregnancy or breastfeeding.